The BabyPlus Prenatal Education System is a set of sound lessons that are played to the prenatal child. benefits will last a lifetime. This patented, prenatal curriculum is designed to strengthen your baby's learning capabilities with naturally derived audio lessons. 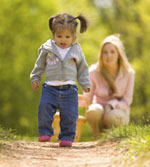 For your child, the developmental benefits of BabyPlus last a lifetime. Parents who hope to give their prenatal child every intellectual, developmental, creative, and emotional enrichment will want to take a closer look at the BabyPlus Prenatal Education System. BabyPlus is a patented, prenatal curriculum developed to strengthen a child's long term learning capabilities. These naturally derived audio lessons are founded on the very language of the prenatal child, the language of the maternal heartbeat. As a baby distinguishes the simple rhythmic sound lessons of BabyPlus from those of the mother, auditory learning begins. As a mom's pregnancy progresses, so does the BabyPlus curriculum. The baby is introduced to a sequential learning process at a time during development when the advantages will be most enduring and significant. The developmental benefits of BabyPlus last a lifetime. "Baby Plus may have been the simplest, yet most important thing I did for Mary before she was born. From her quiet, calm alertness as a newborn to her, now happy, interactive personality as a toddler, I have been amazed at what a difference Baby Plus has made in the way she learns from everyone and everything around her." "As a pediatric physical therapist, the developmental strengths of the BabyPlus children I've seen in my practice are very convincing. These children consistently demonstrate very strong fine and gross motor skills, early milestones, and long attention spans. Now, I too am a BabyPlus mother (of three) and I have seen countless additional benefits in my own children, most notably their strong learning skills and long-term memory, and adaptive dispositions. What a wonderful investment!" "BabyPlus is a brilliant system. I have used it myself, will definitely use it again, and have only positive things to say about it in my book." "For their child's lifetime development, every parent should hear about this discovery, an innovation representing the single most significant step science has taken toward increasing infant potential." Rene Van de Carr, M.D. "I think that someday, the use of BabyPlus will be absolutely as common during pregnancy as is taking a prenatal vitamin today." "I just love your BabyPlus! I would recommend it to anyone! My son was alert and active from the time we began using your product at 18 weeks gestation. Gradually, he began to anticipate his "sessions" and would kick when it began. Since his birth he has been more alert than the average baby. He is now 16 months old and has more than 50 words in vocabulary, listens intently, watches lips and speaks 10-15 words in his father's native Italian! I credit half of this development to Babyplus!! He has benefited greatly from your product!" "An expectant mother provides for the physical growth of her developing child through conscientious lifestyle, diet, and the use of prenatal vitamins. BabyPlus offers similar enrichment by strengthening a child's learning capacity at the most critical period of development. I have seen the remarkable benefits myself." Every mother knows that her child's physical development begins during the crucial prenatal months. Taking a prenatal vitamin to enrich a child's nutritional environment is the standard-of-care for providing an optimal environment during a child's earliest physical development. It is widely accepted that a child's learning ability begins during those very same prenatal months. Educators, scientists, criminologists and physicians alike have long ago acknowledged the vital importance of a healthy and enriched prenatal environment as it pertains to the long term development and learning ability of a child. An age-appropriate prenatal curriculum strengthens a child's ability to learn during the developmental period when the advantages will be most significant for the child. In the prenatal months, the brain is at its most receptive stage of learning. 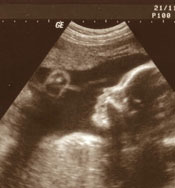 The prenatal baby's hearing is fully developed by the 18th week of pregnancy. Independent studies have demonstrated that, for the duration of the pregnancy, the baby can actually compare and contrast simple sounds. By encouraging this simple 'auditory exercise' during this crucial period, these studies have demonstrated that the child may realize significant long-term developmental benefits. Dr. Mark Pitzer, Ph.D. writes, "Research suggests that a child's intellectual development is influenced equally by their inherited genetic blueprint and the early immediate environment." This crucial early environment is not just the "0 to 3" years of age that we hear so much about, but actually the "prenatal to 3" years of age. An expectant mother's uterus is not a 'soundproof booth'. The developing child can certainly hear many of the sounds and noises in his or her mother's external environment. However, these sounds are fairly fleeting. The one true and consistent sound presented to the child naturally during those months is the mother's heartbeat. For the duration of pregnancy, this is the natural language heard 24 hours a day, 7 days a week. It is a natural, simple, and repetitive sound. Therefore, in order to truly communicate with and encourage early comparative learning during the prenatal months, sounds similar to the mother's heartbeat are the most developmentally appropriate. For more information on prenatal education go to BabyPlus. Can Prenatal Learning Aid in Bonding? Bonding is the relationship that forms between a mother and her child that establishes the basis for an ongoing mutual attachment. Bonding implies that there has been interaction between them, each contributing to the relationship at some level. The encouragement and practice of prenatal learning provides the mother with an opportunity each day to focus on her prenatal child. She can offer her prenatal baby auditory stimulation that she knows will help the baby's cognitive development. It is a loving, conscious effort on the part of the mother and it is satisfying to her maternal instinct to be able to do something so very beneficial for her baby. As a mother observes the baby's movements in response to a prenatal curriculum, communication between the mother and baby has begun. The baby reacts with interest and curiosity to these new sounds which have entered its otherwise predictable environment. In brief, their interaction becomes an elementary form of learning, like playing a game (the same delight seen in infants playing peek-a-boo or pat-a-cake). Parents who have engaged in prenatal learning with their babies report various responses. 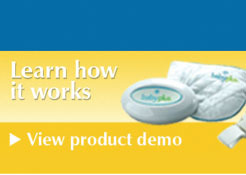 Typically, babies will become active during the sessions, kicking in rhythm with the simple sounds of BabyPlus. Other babies adjust their biologic clocks to begin arm or leg movements at the precise time a session is to start (even if the mother is late) if the mother turns on the BabyPlus unit at the same time each day. Still others who are normally active may cease activity during the sessions, as if they are concentrating on the sounds. Naturally, while such bonding is most significant between the mother and the prenatal baby, others can share in this interpersonal exchange. Not only do they observe maternal happiness as an effect, they can place their hands or face against the mother's abdomen and feel what is going on. In this way the family can experience the beginning of interactive family communication. How a baby responds can actually provide a preview of future personality traits! Does Playing Music Encourage Prenatal Learning? Every prenatal child experiences the sonic environment of his or her mother: outside voices, traffic, television, radio, and CDs. The sounds generated by this outside stimuli pass through the abdominal wall, which lowers the volume by about 35 decibels and muffles the sounds. For the baby, it is much like listening to sounds underwater. Even though the baby is exposed to these sounds, they pass by him as white noise because they are too complex and the baby has no frame of reference for them as sounds. Listening to music is a pleasurable experience, and certain types of classical music can have a calming effect on a pregnant mother. Since the prenatal baby can sense a mother's mood, the mother's emotional state can have a corresponding calming affect on the baby. However, music is not 'basic' enough to be the most effective prenatal curriculum. The most dominant sound heard by the baby is the mother's pulsing heartbeat at 95 decibels. This sounds to the baby as loud as a rock band concert would sound to you. 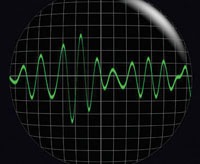 This heartbeat occurs naturally at about 1 beat per second. The baby's heartbeat is approximately 2 beats per second. As the baby develops and hears these two sounds repeatedly, they become imprinted in the baby's cognitive architecture. They become the permanent foundation upon which all learning will be built. The most effective prenatal education curriculum is one that utilizes the main element of the baby's frame of reference, namely, the heartbeat. Research has shown that introducing a heartbeat sound at a lower decibel level (like the simple rhythms of BabyPlus at 65 decibels) encourages the prenatal baby to begin to differentiate between the two sounds. 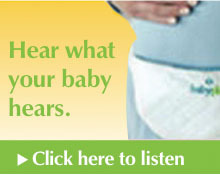 Click here to hear what your baby would hear inside the womb. The next progression is to slowly increase the rate of the sound used in the curriculum. Following this, the curriculum can introduce a slight tonal change. All changes in the prenatal curriculum must be very slight to give the prenatal baby the means of discriminating between these similar sounds. In this pattern of staged progression, the baby begins to learn. Such sounds must be very simple and repetitive, something which neither speech nor music can accomplish as effectively. That is why nursery rhymes, tunes, reading aloud, and classical music are simply too complex during this early stage of development. What are the Benefits of Prenatal Learning? Parents and researchers alike have observed and measured the benefits associated with the BabyPlus Prenatal Education curriculum. Babies that have enjoyed this prenatal curriculum are born more relaxed and alert. Typically, their eyes and hands are open at birth. These infants are more responsive and interactive and are visibly ready to absorb and appreciate their environment. 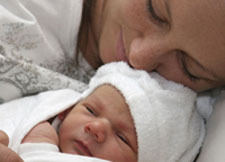 Parents report that these babies nurse more readily and self-soothe more easily. Parents also report that, if their care giving skills are consistent, the regular sleep/wake cycle of their baby becomes quite consistent at an early age in the infant's life. There is also documented scientific evidence that the immune system of an infant who sleeps well and sleeps regularly is actually stronger. Additionally, an obvious side benefit of a well-rested baby is a well-rested parent! Babies that have benefited from prenatal learning are reported to reach early childhood milestones, such as the ability to point to body parts on command, walk and talk, etc. ahead of their peers. Utilizing such milestone assays as the Clinical and Linguistic Auditory Milestone Scale (CLAMS test) and the Vineland Social Maturity Scale (school readiness test), these children have shown an increased attention span and measurably improved school readiness. Parents have also reported that BabyPlus children exhibit greater creativity and independence. All of these traits result as a combination of both genetics and an enriching early environment. Strong thinking children are more successful in school and in life. Prenatal learning does not create a "genius baby" anymore than a prenatal vitamin creates a "bodybuilder." The prenatal months of early development are simply the right time to strengthen the foundation for learning.